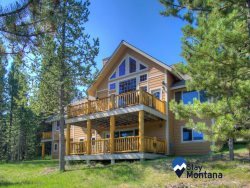 Book your next stay at one of our luxury rental properties in Montana. With beautifully crafted rental homes in Big Sky, Livingston, and Bozeman, our guests enjoy upscale lodging with breathtaking views. We offer features and amenities that go above and beyond - like catering services, washer and dryer, fully equipped kitchens, and outdoor space heaters. With plenty of room for groups, our south western Montana and Big Sky luxury rental homes are designed and equipped to entertain and impress. Relax by the fireplace, in the hot tub, or on the back deck overlooking your private pond. With thoughtful decor and spacious floor plans, we aim to create an atmosphere that invites calm, even for large groups. Each of our properties are in a prime location for both access to the outdoors and to nearby towns. Whether you are looking for local entertainment like dining and shopping or a remote fishing trip, our vacation rentals not only make it easy to access a variety of activities but also provide an added luxurious experience for a memorable getaway. Booking online is easy, and our staff are available to ensure a stress-free experience, giving you the chance to truly enjoy all Montana has to offer. Browse and book your Bozeman, Livingston or Big Sky luxury rental today!